This year you can give the gift of loveliness. Just what a woman wants: beauty and beauty accessories. European Wax Center carries a line of accessories called Strut 365. They have brow accessories (my favorites), ingrown hair management products, bath products and all around beauty accessories and bath products. 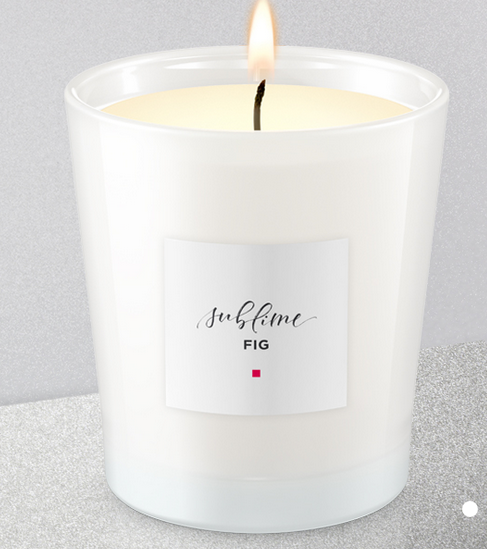 This year for the holidays they are offering a beautiful Sublime Fig Candle too. It smells divine. They are in various locations around the United States. So book a wax then keep it up with these lovely accessories. You will feel amazing. Pump up your brows. This lightweight smudge-proof powder can be applied dry for a natural look or wet for a dramatic look. Blend the two shades to match our brow color perfectly. Ideal for a softer, fuller, more natural look. Available in three shade combinations.This is my all time favorite brow powder. I have gotten more compliments with this color than ever before. It goes on so easily and has quite the punch for brow powder. It doesn't budge once it's on either. I really love this brow powder duo. I use the one in Sienna/Sepia. There is a lighter one for blonds and light brunettes in Sand/Taupe. Above in the photo is the Sepia/Sienna. Below you will see the Sand/Taupe. Keep your brows bold beautiful on their best behavior. The soft-holding gel formula instantly shaped and sets brows in place without leaving them stiff and sticky. Just the want along your brow to seat and define. Does not leave brows stiff or sticky. Available in clear. This is great if you tend to have unruly brows, like I do. It tames them and puts the in their place. Which is neatly on your forehead! Take gorgeous to new heights. Apply this soft highlighting illuminator to give your arches a beautiful boost. Apply along the brow bone and above the arch, blending with the sponge end. Available in one universally flattering shade. For an even more gorgeous glow, use above your cheek bones and in the corners of your eyes. This highlighter is great to open up the eyes. Do you have irritated skin? Then this is the product for you. Start and end your gorgeous day with this fast-acting face serum that restores and replenishes stressed skin while calming irritation and redness.It contains an exclusive, patented emulsion technology that restores and replenishes skin, after waxing and hair removal.It works on skin that is irritated from other reasons too. Apply 2-3 pumps morning and night until skin is back to normal. Let your face feel fresh and fabulous with this lightweight, gentle, non-abrasive exfoliate designed specifically for your face.It has naturally derived fruit extracts that eliminate dry, dull surface cells and support natural cell turnover, so that skin looks luminous again. Fruit extracts are enzymes that help eat up dead skin cells and remove clogged pores so that skin look amazing after the treatment. Our exclusive COMFORT BLEND™ calms, nourishes and moisturizes the skin so that it is soft, supple and beautiful. Say goodbye to dead skin. Hello gorgeous. Accelerate cell renewal without any harsh abrasives around hair by helping to keep hair follicles clear after waxing. Naturally derived fruit enzymes eliminate dry, dull surface cells and support natural cell turnover. Their exclusive COMFORT BLEND calms, nourishes and restores skin. Use before and after waxing, at least three times a week. Gentle enough for daily use. One of the best body exfoliants I have ever used. Excellent for keratosis pilaris and for keeping away ingrown hairs. Use sparingly but wisely. Keep those pesky ingrown hairs in check with our lightweight, gentle, alcohol-free serum. It clears and prevents unsightly bumps when used daily. Contains natural Amazonian berry extracts and anti-oxidants to help nourish and comfort skin. Their exclusive COMFORT BLEND calms, nourishes and restores skin. Use once a day to prevent ingrown hairs or twice a day to treat existing breakouts. This stuff works great. It really helps prevent and treat ingrown hairs. especially treat them. It has glycolic acid in it to keep the hair follicle free of debris (skin cells) that clogs it. Helps to slow regrowth of hair between waxes. Use the dual-action cleanser and exfoliator every day to restore, clam and nourish skin while help prevent ingrown hairs. This body wash is great to wake you up every day. It has a refreshing scent that is beautiful. I love that it helps ingrown hairs too. That is very useful. And it slows down hair regrowth. How many body washes can claim that? Not many if any others. It comes in three scents Cheeky Strut, Graceful Strut and Sensual Strut. Cheeky Strut leaves you filled with wanderlust and eager for adventure. Refreshing, sparkling and juicy. Notes of madarin naartjie, mango soft peony and violet. It is a lovely scent, very uplifting and happy. Graceful Strut is like gently swaying in a hammock in the breeze. Clean, fresh, delicate. Notes of freesia, white rose, muguet and white musk. A very clean scent, like that of fresh linen and fresh wash. Sensual Strut is is sparkling notes of refreshing and juicy mandarin naartjie and succulent mango blended with a velvet heart of soft peony and violet. A creamy, luxurious exfoliant that polishes away dull, dry skin for an undeniably radiant glow. This high-performance exfoliator helps prevent unsightly bumps and ingrown hairs. Visibly helps slow the regrowth of hair between waxes. This is a great physical exfoliant, I love how it helps with my keratosis pilaris of all things. I like how it keeps my skin feeling smooth. I love the scent. Of all three scents in the Strut365 collection, Graceful is my favorite. It comes in three scents Cheeky Strut, Graceful Strut and Sensual Strut. Cheeky Strut leaves you filled with wanderlust and eager for adventure. Refreshing, sparkling and juicy. Notes of madarin naartjie, mango soft peony and violet. It is a lovely scent, very uplifting and happy. Graceful Strut is like gently swaying in a hammock in the breeze. Clean, fresh, delicate. Notes of freesia, white rose, muguet and white musk. A very clean scent, like that of fresh linen and fresh wash. Sensual Strut is is sparkling notes of refreshing and juicy mandarin naartjie and succulent mango blended with a velvet heart of soft peony and violet. Nourish and pamper your beautiful skin every day with our ultra-hydrating, fast-absorbing body lotion. It helps to soothe super dehydrated skin. It also helps to visibly slow down hair growth between waxing appointments. That alone is worth the price of the lotion. It comes in all three scents: Cheeky, Graceful and Sensual. Cheeky Strut leaves you filled with wanderlust and eager for adventure. Refreshing, sparkling and juicy. Notes of madarin naartjie, mango soft peony and violet. It is a lovely scent, very uplifting and happy. Graceful Strut is like gently swaying in a hammock in the breeze. Clean, fresh, delicate. Notes of freesia, white rose, muguet and white musk. A very clean scent, like that of fresh linen and fresh wash. Sensual Strut is sparkling notes of refreshing and juicy mandarin naartjie and succulent mango blended with a velvet heart of soft peony and violet. For the holiday season, with any $49 purchase, you get this Sublime Fig Candle your purchase. It makes a great gift. As do all of these items to any beauty junkie. I was very happy with all of the Strut365 items from European Wax Center I tried. I found my Holy Grail eyebrow color, renewing face serum, some great body products and I found a new ingrown hair/keratosis pilaris serum that is the bomb. All of their products are top notch. Very well executed, well made, just great overall products, in my opinion. All of the above items are available at any European Wax Center location near you. To find a European Wax Center location nearest you go to www.waxcenter.com/locations. Make an appointment for a hair removal session today.